You can learn a lot from the outside world. From a fresh perspective on your business from an outsider. What would they do in your case with their knowledge? Now and then we give such an outsider the stage. In this case data specialist Denis Doeland gives us his vision. It’s a long read so sit down and enjoy his story. Just imagine: you have total control over the Paradiso venue and from now on you get to decide exactly how the Amsterdam pop temple is run. What would you do? I was asked this a while ago by Paradiso Labs. Many organizations are concerned about the effects of the new privacy legislation. The so-called General Data Protection Regulation (GDPR) requires organizations to be more precise with the data that they store of citizens (such as clients and followers) from May 2018. This legislation came after social unrest about the usage and storage of data. The fact that the new data legislation has a gigantic impact on the daily practice of data for clubs and pop venues is now beyond doubt. Do we now know all implications? Hell no! In the same way, people were unaware that cows did not provide sour milk and horses did not go berserk with the introduction of the steam train. For now, the fear of data usage seems to resemble the fear of steam trains. You are striving for a method to collect data which suits the setting of your organization. You will explore multiple options to store your raw data directly from your website and social media channels, but also external data sources. However, technology is not the point of departure for the use of data. The people who use the data and the objectives which are set by a framework form the point of departure. I am convinced that each organization will be assisted by the (smart) use of data. And that every organization can shape its digital transformation via the Business Acceleration Framework. That is why I am informally sharing these eight tips on how Paradiso – or clubs and pop venues in general – can become more digitized and efficient, can continue to use their data and leave the competition far behind. There is a large difference between what companies imagine the current digital revolution to be and the actual impact of the digital innovations that existed in recent years. You see faster, smarter units being created, where software often takes over the role of hardware. For instance, you have an app to take photos, instead of a real camera. That is the digital revolution, on the surface: decreasing sales of alarm clocks and cameras. Now I hear you think: people like or follow certain pages – so what? This relationship with potential fans and clients cannot be underestimated as an organization. It is the most important predictor of the growth (or shrinkage) of operating capital, as that virtual, social network and the various internal and external systems contain digital assets. These assets are formed by the context of data, which can be used to optimize marketing, communication and sales processes. Because this virtual capital is so important, we now even speak of a relationship economy. Or the economy 4.0. I would, therefore, design Paradiso on the basis of the characteristics of this new economy. 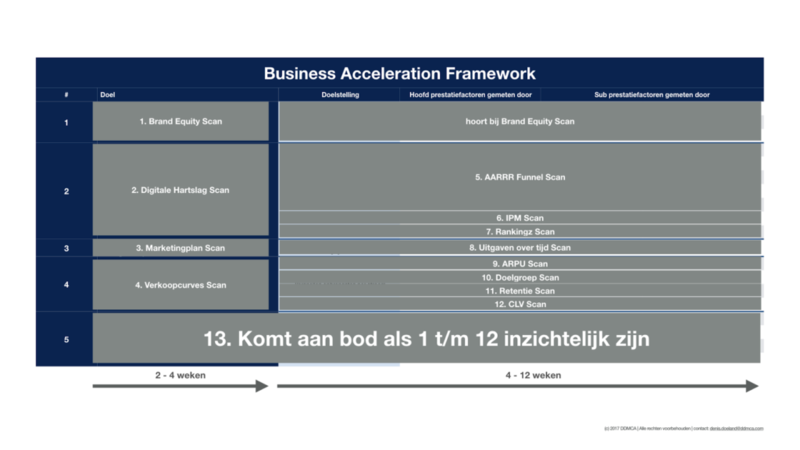 Starting with the deployment of the Business Acceleration Framework and the Business Acceleration Plan. The latter includes the comprehensive digital transformation of an organization and allows the framework to take off. Below you will find the steps that you must take before you can commence this plan that will allow your business to take off. Handy tools and usable insights will not have any impact if you do not attach any objectives to them. After all: what are tools or insights used for? A real digital vision, therefore, starts by attaching targets to the digital transformation. Which objectives should clubs set themselves? Brand Reputation Performance (brand reputation) – This is the approach of the marketing (and the most important milestones), that you should be able to summarise as a graphic overview on one single A4. This overview must be able to show that a rhythm is created in the communication of a club. This rhythm (the digital heartbeat) is hugely important and has a direct impact on your Brand Equity. Business Activation – In addition to the optimization of the existing business models, as a club, you also wish to develop new revenue models. Consider a mature eCommerce department or the digital exploitation of (video) content. As a club, when you have determined your five objectives, you can commence with the nine steps of the Business Acceleration Plan. Before you can commence with the Business Acceleration Framework, you will need to go through the nine steps from the previous graphic. These prepare your club to shape the digital transformation and allow your business value to take off. These nine steps must be taken by every club if they wish to become a digital organization. It is essential to let a digital mindset lead your club. For instance, you may have to recruit other staff, because everyone (at the office, not necessarily behind the bar) needs digital skills. Therefore, there is no digital department anymore: every department has people with digital skills. Everyone should possess a digital mindset if you wish to use the framework. The Business Model Canvas helps strategic managers and start-ups to create a new business model or assess an existing model. This canvas is also essential for clubs. It creates insight into four key areas: clients, offer, infrastructure and financial viability. The canvas serves as the foundation for the Business Acceleration Framework. The data from the Business Model Canvas really comes into its own in the Business Acceleration Framework. This leads to concrete, usable insights that will take Paradiso further. Because of this we have business intelligence which is required to create content, starting and the optimisation of sales, marketing, communication and service processes. Here it becomes clear which input results in which output. Often changes encounter resistance. That is understandable. Some of the colleagues are scared, for instance, that new technologies will take a lot of time and effort. With the Business Acceleration Framework this is not the case in the long term. When a club reaches Business Acceleration Maturity, then you can see the results of your marketing or sales efforts. That is why you strive for Business Acceleration Maturity and you determine in advance when this phase has been reached. 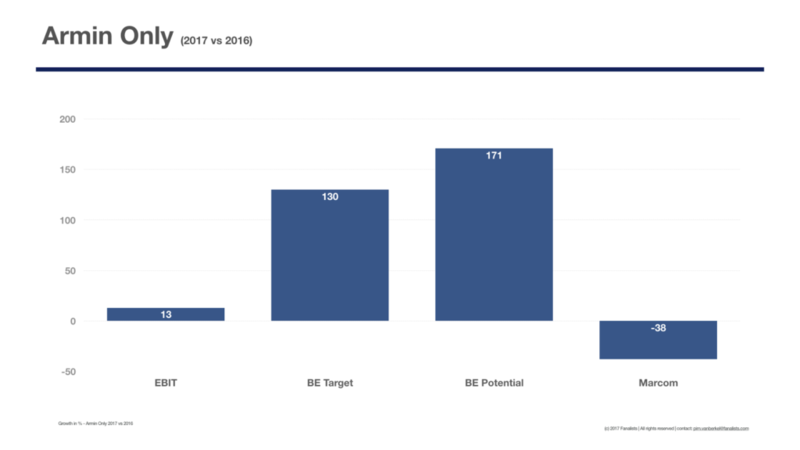 This makes it transparent for colleagues why the efforts to reach Business Acceleration Maturity are necessary. Ultimately as a club you want excellent business execution and analysis. This is achieved in the Business Acceleration Framework, in which data is analysed which arrives there via the Data Management Platform. Data is processed in this platform in various forms, but also stored, transformed and extracted. These come in via the Data Sources Assessment. As Paradiso, I would want to know where my data is originating from. And whether the data is legally useable according to the new privacy legislation. After all: without knowledge of your data landscape, as a pop venue you are lost, in principle. The determining (and design) of your interfaces and channels is one of the first practical applications of the Business Acceleration Framework. For example, consider channels as partnerships, releasing content via sites and apps, but also the deployment of digital adverts. When you fill these channels, as Paradiso you can determine whether the current use of resources is paying dividends. 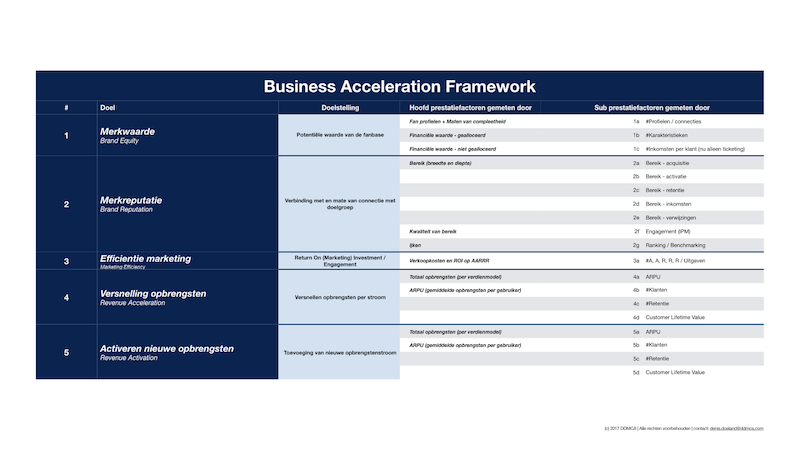 The Business Acceleration Framework has a significant amount of ‘measurements’ that you have to enter. Consider the number of returning clients (the retention), the reach and the interaction of the release of content, the level in which you are aware of client profiles, etc. You can find these parameters below, with additional explanation. Load all data in the different basic objectives, which is how you lead your club through the framework. Would you like to know if your efforts are worthwhile, then you have to be able to compare the current situation with that of the past. 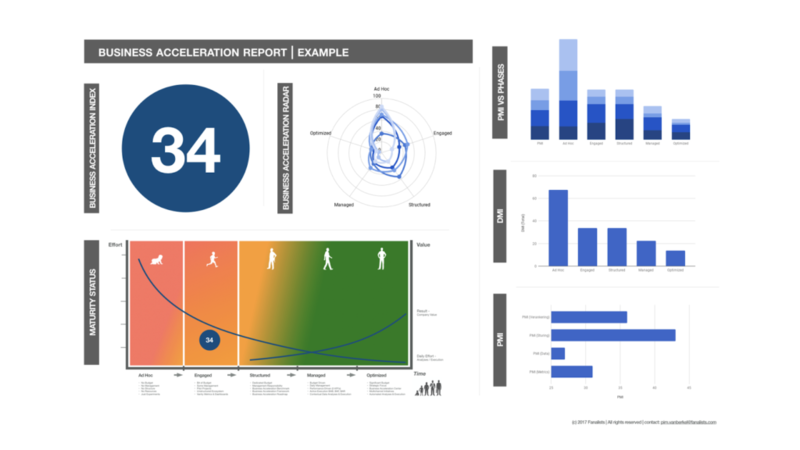 You can do this by designing your dashboards, because this will provide you the control on the manner in which your club performs. Data is collected and processed here, which leads to valuable insights. The 12 basic analyses (more about this later) help with this, because they allow you to compare in real time which efforts lead to which results and the value of certain investments. Design the basic analyses of your club according to the below graphic. This will provide you with insight into the five objectives that clubs making a digital transformation have to set. Monitoring the results of the basic analyses is of vital importance. You run the risk that as a club you have been investing in something for a while which has not been leading to specific results. That is why it is important to measure the results of experiments. Measuring provides knowledge, and a monitor allows you to measure, and therefore know, much more. Maybe the posters for events that you hang up are not worth it at all and you rather learn this today than tomorrow. These are the digital assets of a club. You calculate this value by assessing the profiles that you have and to scan whether they can legally be used. Profiles are worth more if you have the various characteristics and features, such as the first name, surname, e-mail addresses, addresses, interests, etc. Clubs strive for comprehensive (identified) profiles: after all these provide larger cash flows and therefore a higher Brand Equity. You strive to find a rhythm in the level in which you as a club post on social media. This rhythm is your digital heartbeat. Moreover: without a digital heartbeat, you do not have to worry about the contents of the messages. Then you have basically died in a digital sense. Have we developed a digital heartbeat? Then I would focus on the content with the content impact model. We first focus on our post rhythm (the digital heartbeat) before the promotion of an event at Paradiso is commenced. We always ask these questions: does this campaign fit our rhythm? And: do we succeed in filling the sales funnel on the basis of our plan? If we do not do this, you are unable to measure the objectives and you will set random targets. That is why the marketing campaign will never be efficient or promising. That is why we initially carry out a Marketing Plan Scan. Every sales curve is a rising line of ‘sales’. Consider the ticket sales for a concert. By comparing historical data, you can discover what such a sales curve generally looks like and how far in advance people purchase tickets for a concert. By discovering the curve, we do not deploy any marketing if no-one is willing to purchase a ticket yet. Marketing becomes more efficient by reconciling it with the curve. The AARRR model allows clubs to convert their followers into physical visitors or clients. 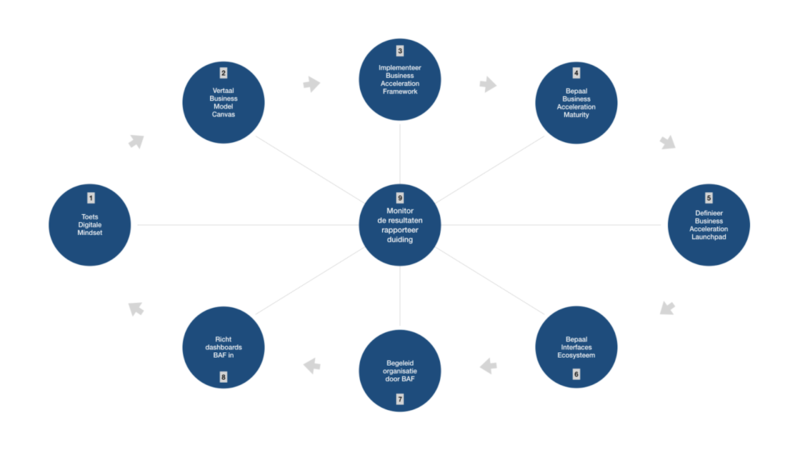 Using Dave McClure’s AARRR model you gain control over the digital ecosystem of your club. The five layers/metrics are accrued from the different data sources of the different channels. These are: acquisition, activation, retention, revenue (income) and referral. I would like to assess these five layers at Paradiso, so that we can see the results of the marketing efforts, where the bottlenecks are in this funnel and where optimisation is required. IPM stands for interaction per thousand fans. This allows you to compare pages or channels with each other. The IPM formula is: ((Number of comments + likes) / number of posts)) / #fans) = IPM. I would calculate how Paradiso relates to the rest of the ecosystem, by developing a digital heartbeat and to discover how it interacts with others in the digital ecosystem. This results in the so-called connection ratio, which expresses how many likes, comments, shares, etc. receive messages from Paradiso. The Benchmark therefore focuses on the number of followers and the online interaction of Paradiso and sets this off against the level in which this is present with the competition. After all, every club or pop venue is battling for the highest position on Facebook and Google. That is why we compare the digital performance of Paradiso with that of the competition. With the sales curve (the regular sales peaks), there is usually marketing expenditure to instigate these sales. By setting off the marketing investments of Paradiso against the results, you arrive at an Expenditure over time Scan. Here we discover which resources and which timing leads to which result. The ARPU is the average revenue per client (also known as: the average revenue per user). This parameter has a direct influence on Brand Equity. That is why at Paradiso we assess how the sales curve has proceeded in recent times and we then search for the retention. This ensures that clients or visitors return, so that the turnover rises. In addition, we wish to extend the life cycle of clients (the CLV), in order to improve the brand equity in three ways. This scan also allows us to better use the AARRR and is therefore in fact essential for every club. For each club it is important to focus on the demographics (target group), so that it is clear which target group you wish to communicate with. This also contributes to an optimal ARPU of a club. You get this data from the client database, website analytics and social media analytics of your club. This scan revolves around the question: do my visitors return? A good practice example: if you organise a certain party every week and more people come every week, is it going well with that party? It seems that way. But when visitors do not return, there is no basis for growth. That is why the Retention Scan is one of the first analyses you want to perform as a club, and it is an important growth matrix. The Customer Lifetime Value (abbreviation CLV) is a calculation of the net revenue a client generates, the turnover of the first to the last purchase. You can determine how much value your client has by calculating how much he or she spends, how often he or she returns and how long he or she remains a client. By optimising the CLV, the Brand Equity of a club rises and that is also essential for every club. Once you have completed the above analyses, you can commence with practical applications of the data you have collected. Consider an analysis of the profiles of your clients. If you know which artists the Paradiso visitors want to see, you can adjust the programming to this. That can naturally also be artists that you have not previously booked to play in Paradiso. In this way you apply the data about your club specifically to your commercial objectives. In this way the Business Acceleration Framework contributes to the Brand Equity. If we are discussing artists’ reach, then we must mention Armin van Buuren and the Johan Cruijff Arena. This DJ is evidence that digital fans can unquestionably fill a stadium. By mobilising his digital fanbase he was able to attract approximately 70,000 visitors to the Arena. That is why Paradiso – or any other club – should research the online presence of artists and let this affect the programming. As long as the followers of that artist or band are not bots, they will give a good impression of the number of possible visitors. Another way in which you as a club or pop venue can use data to increase your turnover or result is by optimizing your food and beverage provision. You can do this by connecting visitor (co-)profiles to their expenditure. Here it appears for example that you have to sell organic snacks, cans of Schultenbrau or red wine, because this is what your visitors demand. By connecting their (online) profiles and expenditure to each other, it becomes clear where the commercial opportunities for your food and beverage sales are. All these aspects will contribute to a digitally-driven organisation. All being well, the contact will already proceed digitally in this new version of Paradiso. This comes on the one hand because the club (after all these steps) finds its way in the digital business ecosystem. But also ensures that efforts can be measured and marketing euros can be more wisely used, existing business models can be optimised and new revenue models pop up. 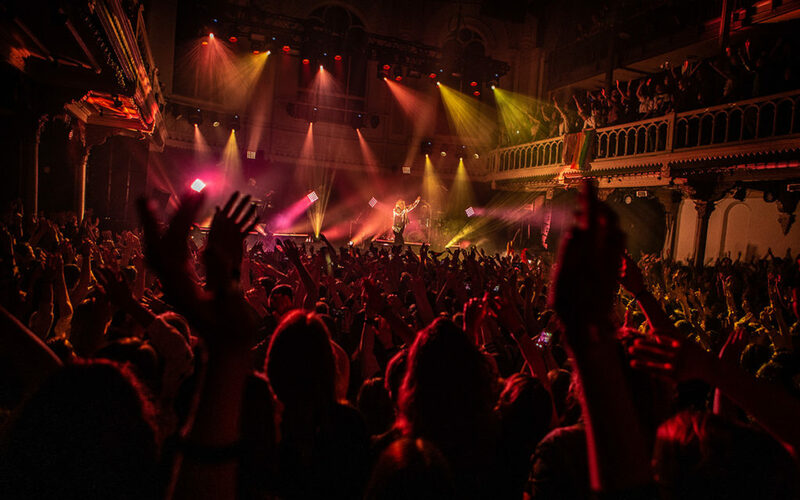 By not only having a location on Leidseplein and Tolhuisplein in Amsterdam, but also by becoming a digital club, Paradiso is unquestionably getting ahead of other pop venues and clubs. The use of information will increasingly be integrated into the daily business to be able to make better decisions and to be able to look for new revenue models. This is only possible when analyses are carried out in a simple and natural way and are therefore not restricted by technology. Technology is not the point of departure for the use of data. These are the people who are using the data and the business objectives set by way of a framework (read: Business Acceleration Framework). You will have to search for a method to collect data which suits the environment of your organisation. There are multiple known options to store raw data directly from your website and social media channels, but also from external data sources. The best method differs for each organisation. External platforms are often suitable, but sometimes a solution created in-house will suffice. However, keep one thing in mind with your search: the match with the existing infrastructure is the factor that weighs the heaviest. Often an infrastructure has a certain power to process and store data. In such a case you can expand your infrastructure relatively easily. In addition, there is the question whether you host the data with your infrastructure, or whether you are connecting in the cloud. The latter is the most preferable, after all you want to be able to access the information at anytime from anywhere in the world. Use the data and analysis tools that you already have in house and add what is missing in the framework step by step. The adoption will be higher by making use of an existing environment. Building a completely new infrastructure is often not required and unnecessary. Investing in a simple data warehouse, the place where all data is stored, in the cloud and data mining, transforming to useable data for reports, dashboards and publishing tools that match the framework is the only correct and most sensible route. The use of data for marketing, communication/or sales purposes has various options. The data required for this originates from the club’s ecosystem and further afield. Upon using the characteristics of fans or clients for marketing, communication, and/or sales activities you must do the following with the data: validate, enrich, profile, segment, match, localise and decide. This creates the correct context and increases the chance of relevance, reach, interaction and transaction significantly. If you have an image of the profile of your fans and clients, you can start meaningful interactions and connections and become relevant (again). The challenge is in discovering the correct context from the framework using automated analyses. If this is carried out well you will prevent irritation from fans and clients, after all irritations can potentially negate the value of an interaction and reduce the relevant value. Many organizations are concerned about the effects of the new privacy legislation. The so-called General Data Protection Regulation (GDPR) (the Algemene Verordening Gegevensbescherming (AVG)) requires organisations to be more precise with data from citizens (such as applicants, clients and followers) that they store from May 2018. What does the GDPR mean for clubs and pop venues that use data to promptly make management adjustments or to develop new business models? What does the legislation mean for the digital assets of an organisation? The GDPR underlines the importance of a high-quality, sustainable relationship with followers, fans and clients. From May 2018 they can disappear even faster from the systems of organisations, which challenges organisations to be relevant in their lives. The GDPR will have drastic consequences for your business if you do not invest in this relationship. An organisation can instantly lose the entire digital assets that it has invested in its existence. It can literally evaporate into thin air. As an organisation you have to adhere to the GDPR to secure your business model and digital assets in the long term. Make a scan of your terms and conditions. The database of the club or pop venue is not a static property, but rather a dynamic environment. It is an environment which requires maintenance and can be further optimised. Working with data demands a switch from the organisation to an analytical company, where data is considered an asset and analysis a distinguishing competence. The design of the processes using the framework and choosing the right people within the organisation to constantly improve this competence is the key to success here. About data and privacy. Would you like to assess your data landscape or do you want to know whether you adhere to the new privacy legislation? Do you wish to test the digital strategy of your organisation? Please feel free to contact via denis.doeland@ddmca.com and I will assist you.